I decided to go with a cheap strat rather than starting from scratch with something like Warmoth guitars (eventually I will), but I just wanted to start with a solid basis for my first customisation job. So the next step was to find a cheap Stratocaster… either eBay or Reverb would provide. and Reverb did. 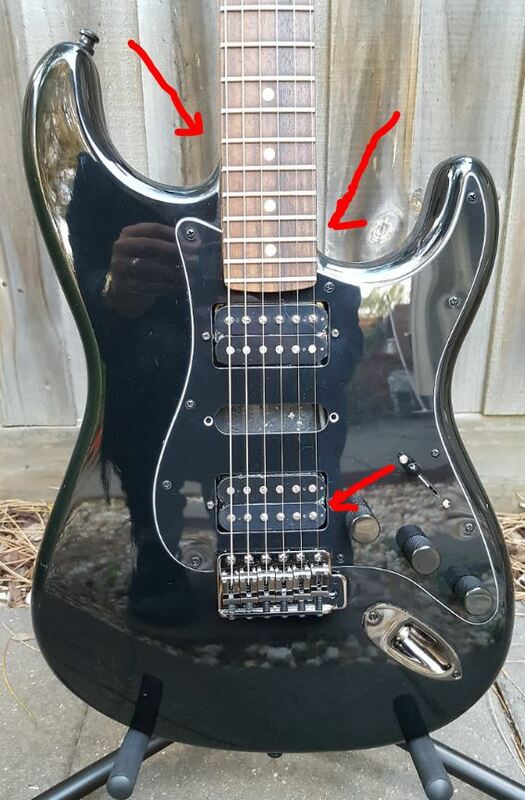 I found a mexican Fender Blacktop Stratocaster with Gotoh parts, rather cheap, and clearly someone else’s customisation job gone wrong. 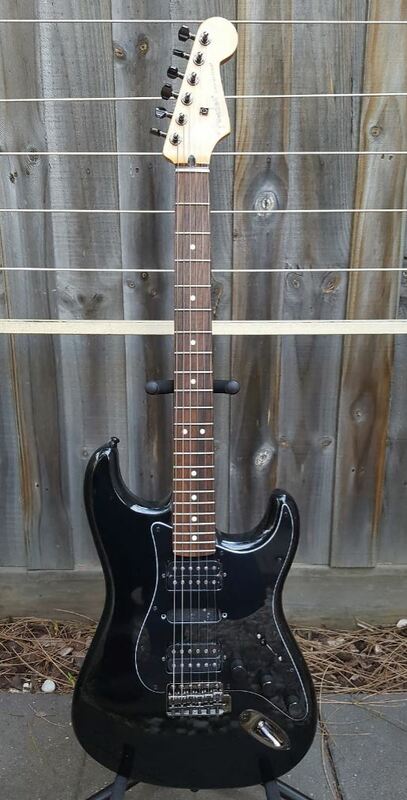 The guitar appeared to be in fair condition, and the listing did specify the changes made to the guitar, including removing the pickup covers (in my opinion, a crime). On close inspection things were not so good. On the following pictures you can clearly see the bridge is too wide for the guitar. The string spacing (E to E) is 56mm, while the Blacktop Stratocaster has a vintage 51mm string spacing. This results in strings nearly outside of the fingerboard. and the strings sit outside of the humbucker poles, which according to DiMarzio and Seymour Duncan is a big no. Now the tuners. The guitar came with Gotoh SG381 Cosmo Black machine heads, which as you can see, the holes did not match the Fender two post alignment holes. 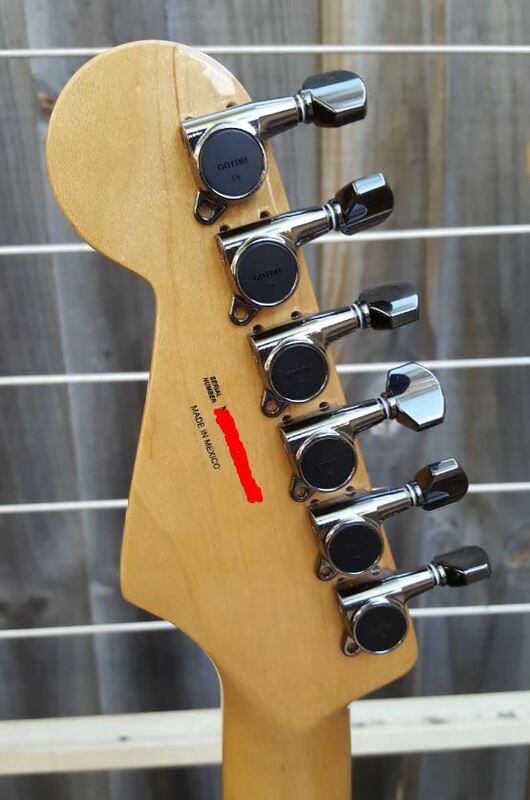 The previous owner didn’t even bother to screw the tuners in, so the guitar would go immediately out of tune. The guitar did sound the same as my other blacktop stratocaster. although there was a short circut at the multipole superswitch which was quickly fixed. sound wise it was a blacktop stratocaster. The neck was all you can expect of a Fender neck, although it had some signs of neglect. In summary, the guitar had good sound but was unplayable. Just a bad DIY. Maybe not the intention of the previous owner, but certainly as a result of his actions. This entry was posted in Uncategorized and tagged bad DIY, guitar modification on June 2, 2017 by Andres Munoz.